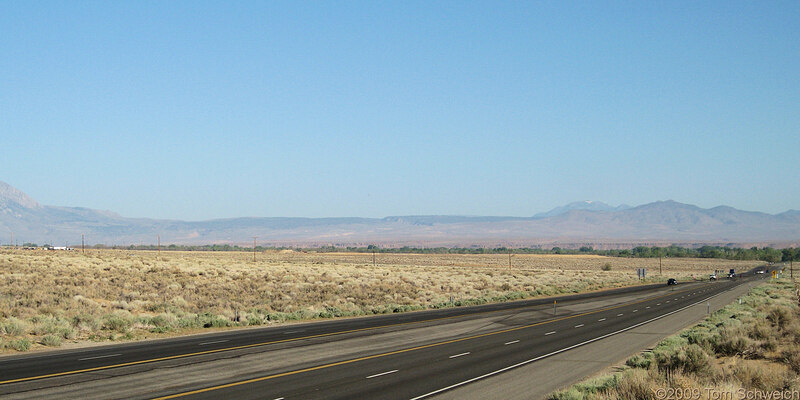 The south rim of Long Valley, composed of Bishop Ash, stretches across the middleground of the photograph. The slopes of Wheeler Ridge are at left, and Casa Diablo Mountain at right, with Glass Mountain, on the north wall of the caldera seen in the right distance. The Owens River Gorge is just left of center. U. S. Highway 395: s. of Bishop. Other photos about Geography - Mono County, California or Long Valley.